It's Oink! 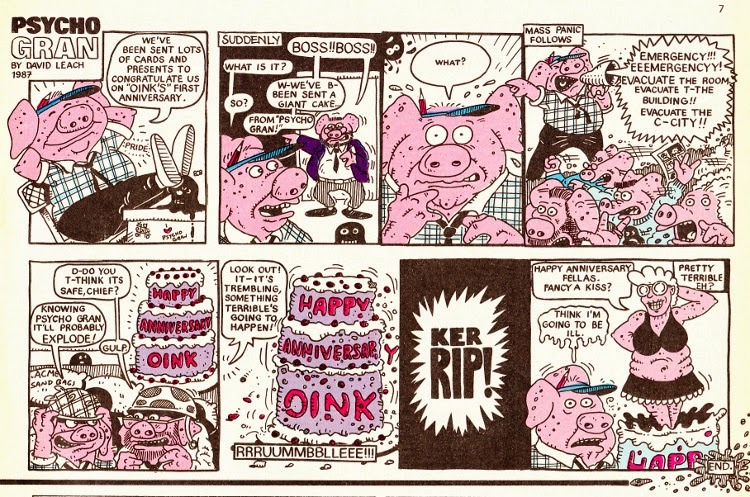 's first birthday issue (not sure if it celebrated its second in an issue and unfortunately the regular comic never had a third) complete with a rather sinister looking Uncle Pigg and inside I dare you to find any strips that miss the mark. I've been saying rather a lot recently how issues are standing out and the simple fact is Oink! was now really hitting its stride. 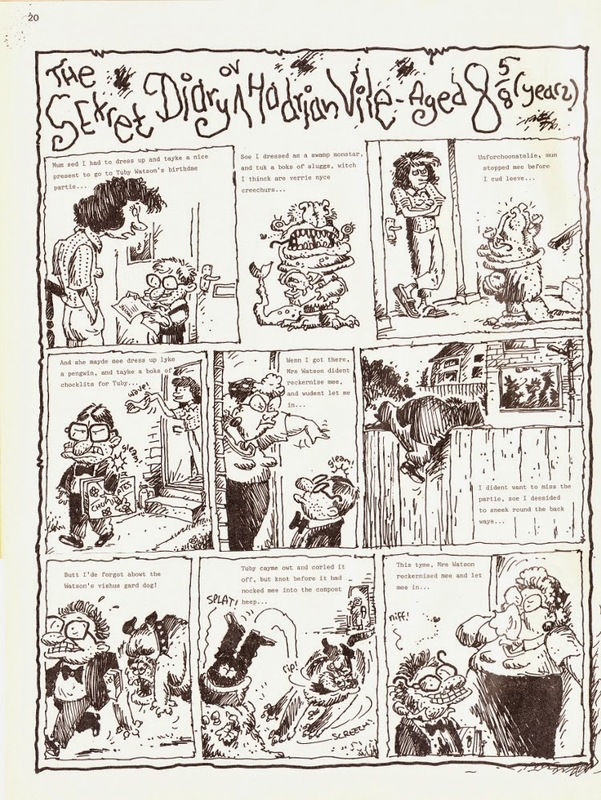 1987 was a marvellous year for the comic, the only one where it'd be out all year long and it just keeps going from strength to strength! I do remember as a kid looking back at the issues in the 20s and 30s as some of my faves, so it'll be interesting for me now to see how they and the following issues up into the 60s stack up to my now-adult eyes. 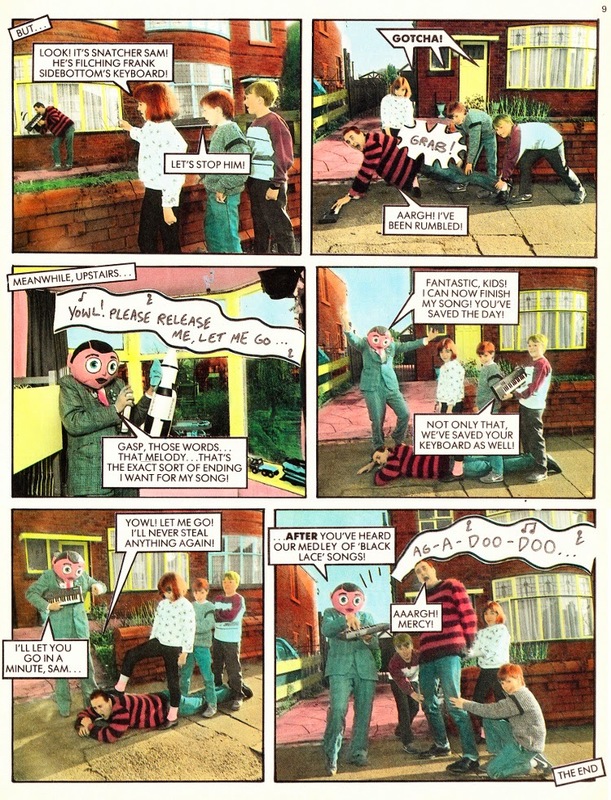 But for now this is a treasure trove of delights, with some of the strips themed either around the comic's own anniversary (of the release of the free preview issue, a week before #1 actually went on sale on 3rd May) or the birthday or anniversary for a character in their own lives. Some examples not included here are Dead Fred's Death Day, a birthday "treat" in Zootown and Billy's Brain makes a brief return for a puzzle page (right after I'd noticed he'd gone missing). I did try and warn you, so don't come crying to me! Right below this was Greedy Gorb munching on a whole birthday cake at the end of his strip, so he mustn't have seen what had just transpired above his head. 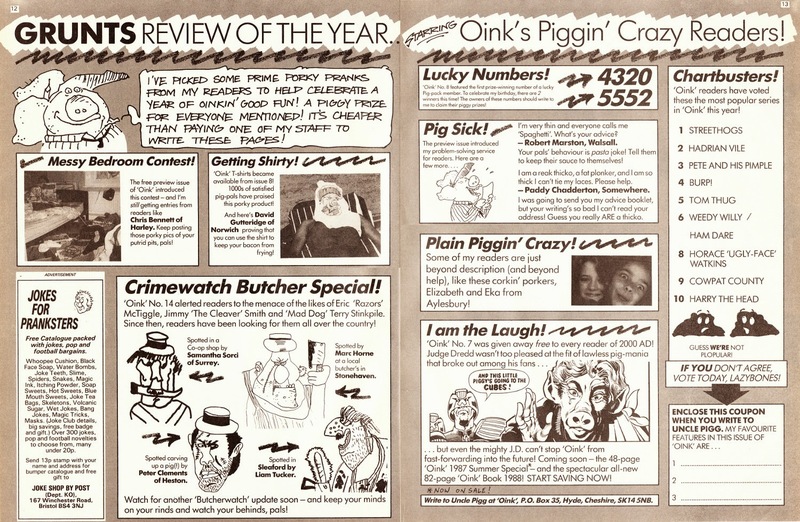 One thing I loved about Oink! was how interactive it was with its readers and this was before "interactive" became the most used word of the 1990s! Most comics would have a standard letters page, with some having a character replying to the readers, something Transformers did wonderfully and which resulted in some hilarious and very sarcastic responses at times. Humour comics kept that going but they printed even smaller snippets of letters amounting to no more than a couple of sentences or maybe a drawing. 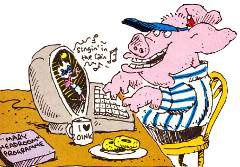 As always, Oink! was different. 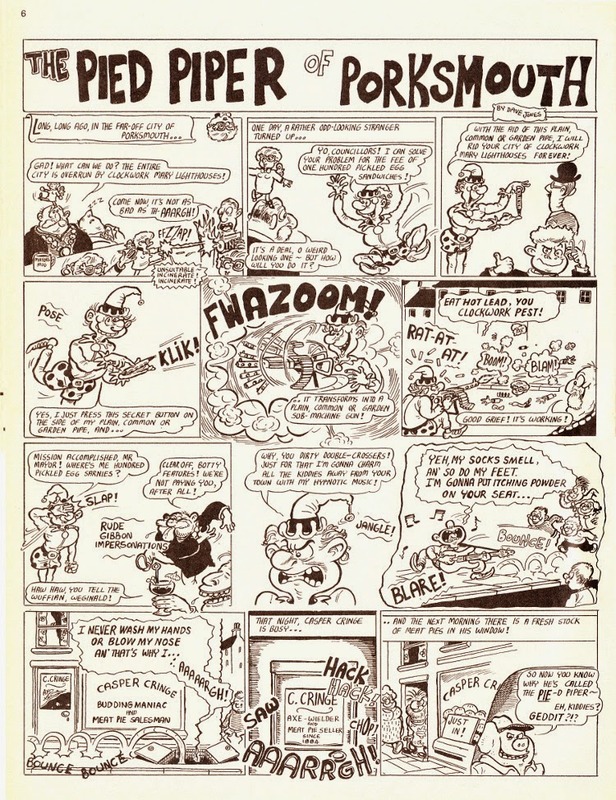 Grunts was the name of the page given over to the readers every issue and these could contain everything from rude jokes for Nasty Laffs and Specs, pig-related clippings from local newspapers, photographs, the messy bedroom competition in the early days, to the usual letters and drawings. Oink! was forever asking the readers to get in touch for one reason or another (as you'll see below, at this time Butcherwatch was a long-running idea) and every time we wrote in we'd to include the three things we loved the most about each issue. I don't know why but I never wrote in. I did mess up my bedroom just for a photo, but then had to wait for the rest of the film to be used up, then developed, then sent back to us. By this stage I'd forgotten all about it. 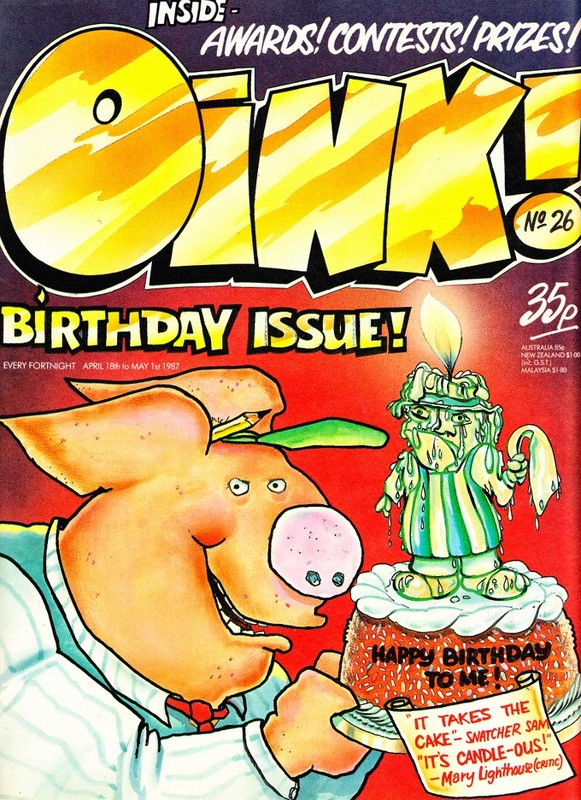 I can remember having drawings or letters published in Thomas the Tank Engine & Friends, Teenage Mutant "Hero" Turtles (and later in life Commodore Format and Edge), but for some reason never sent anything in to my favourite comics - Oink! and The Transformers. No idea why. Now the next strip I want you to see, Tom Thug, I'm not going to include. 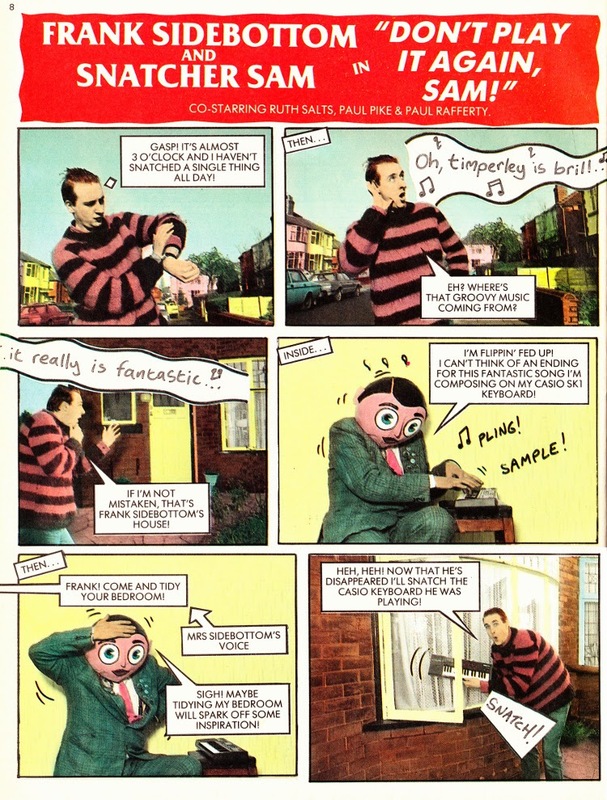 The simple reason is that its creator, Lew Stringer, has already written about it on his own blog at Lew Stringer Comics. It's a wonderful thing, from Tom's explanation of the title of his strip for Wayne, to the great dream sequence caption that I'm not going to ruin for you! 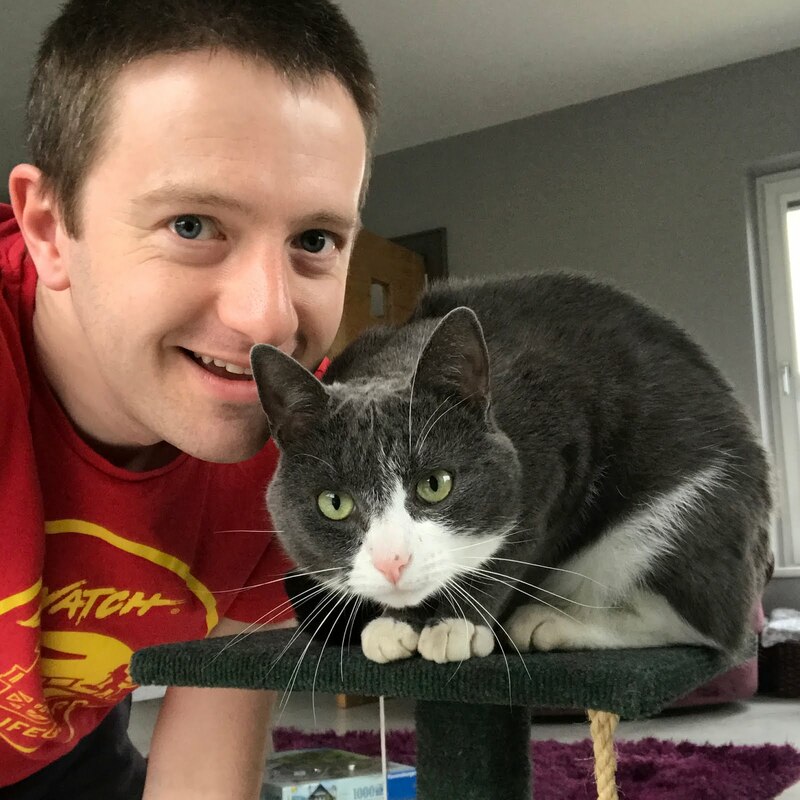 This is also the perfect excuse to get you all to try out Lew's blog if you haven't already and from there you can also access his website and eBay account where you could pick yourself up some original artwork for your walls. 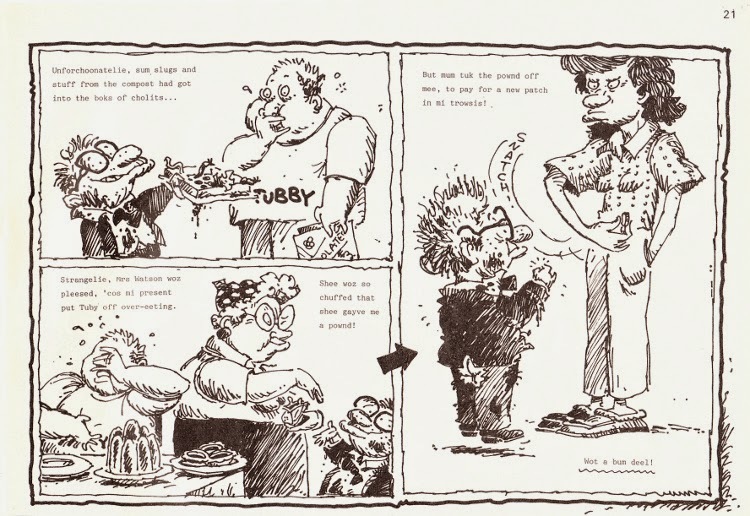 In addition, Lew also has a second blog about comics in general rather than his own work in them, called Blimey! 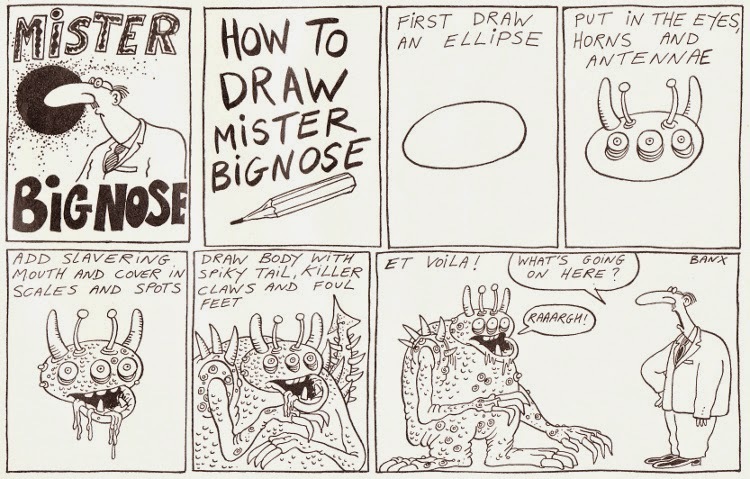 It's another blog about comics! Hahaa that last caption, the voice it put in my head for the monster. Brilliant stuff! Notice a change to the title of the strip there? Yup, Hadrian was ageing along with the comic and was now over 8 rather than 7. I wonder if the comic had continued would we have eventually seen him hit puberty?! 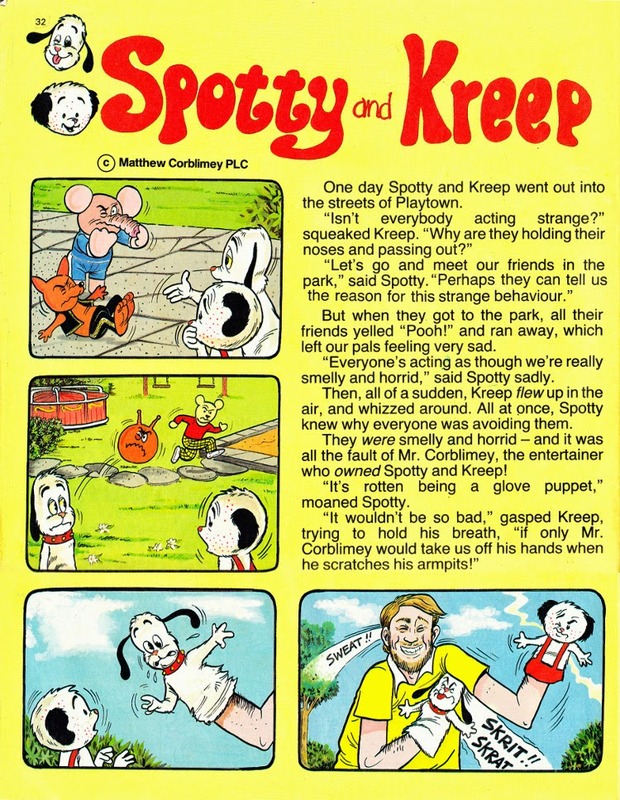 I know it's a spoof, but it's got it wrong on this occasion because for me it was Sooty who was always the one that I thought was "kreep"y as a child, just something about him I could never watch. But anyhow, that final treat. 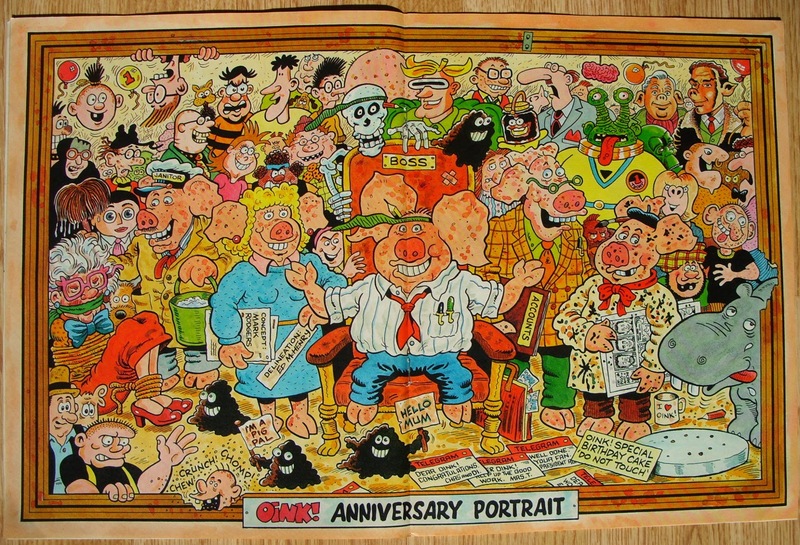 Taking pride of place in the centre pages of this issue is this delightful poster from artist Ed McHenry (based on a concept by Mark Rodgers) featuring all our favourite Oink! stars from the first 52 weeks of the comic's life, including some which were early characters who were to disappear from the run before even getting this far. Can you name them all? Also if you can, can you tell me who the hell that is between Nasty Laffs and Specs and also behind Weedy Willy? Seriously, if you do know please leave a comment. Next issue, the pets special, goes on sale Friday 2nd May. A year already? Wow! That went fast! I know, it's insane isn't it?! So much to look forward to this next year though! #24: GOT TIME FOR ANOTHER ISSUE? Comments are moderated so when you submit any (and please do) there'll be a delay before it appears on the site, just to make sure no spam gets through. But say whatever you want! C'mon, let's be having you. My caricature drawn by Davy Francis. Oink! devised by Oink! Publishing Ltd. The Oink! Blog and Beyond must not be sold at more than the recommended price shown on the cover. Oink! is (C) of those lovely people at Rebellion.